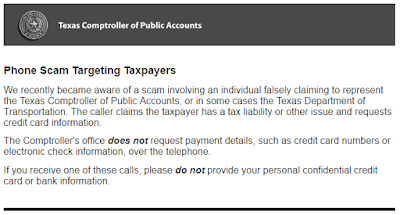 I recently got an email from the Texas Comptroller warning of a phone scam that is targeting taxpayers. As the message says, never give your credit card information over the phone. Protect your information and be safe. "We recently became aware of a scam involving an individual falsely claiming to represent the Texas Comptroller of Public Accounts, or in some cases the Texas Department of Transportation. The caller claims the taxpayer has a tax liability or other issue and requests credit card information. The Comptroller's office does not request payment details, such as credit card numbers or electronic check information, over the telephone. If you receive one of these calls, please do not provide your personal confidential credit card or bank information." Have any questions? Visit the Texas Comptroller Website.